Goat anti Bovine, Canine, Human, Mouse, Rat DLG4 / PSD95. Peptide from the internal region (near C-Terminus) of the protein sequence according to NP_001356.1; NP_001122299.1. Peptide ELISA: 1/64000 (Detection Limit). Western blot: 0.3-1 µg/ml. Approx 85kDa band observed in Mouse and Rat Brain lysates (calculated MW of 85.4kDa according to NP_001356.1). PSD95 is a member of the membrane-associated guanylate kinase (MAGUK) family. It heteromultimerizes with DLG2. With DLG2 it is recruited into the same NMDA receptor and potassium channel clusters. These two MAGUK proteins may interact at postsynaptic sites to form a multimeric scaffold for the clustering of receptors, ion channels, and associated signaling proteins. Tris saline, pH~7.3 containing 0.02% Sodium Azide as preservative and 0.5% BSA as stabilizer. 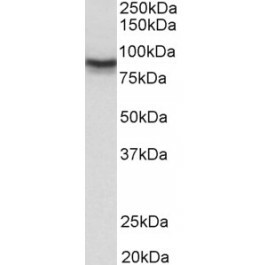 This antibody detects DLG4 / PSD95 (Internal). It is expected to recognize both reported isoforms (NP_001356.1, NP_001122299.1).